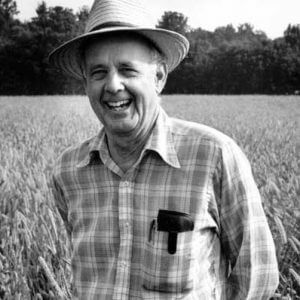 Wendell Berry—farmer, essayist, novelist, poet, activist, teacher—lives with his wife Tanya on the banks of the Kentucky River. There he has farmed a Kentucky hillside for over half a century in his native Henry County, where his family has lived for eight generations. As a small-scale farmer who has used mules instead of machinery for plowing, Berry has taken a stand for decades against the destructive impact of industrial agriculture. He advocates for rural communities, for local economies, and for commitment to the land and one’s place on it. Believing that one’s work ought to be rooted in and responsive to one’s place, he regards affection, knowledge, and memory as the prerequisites for good stewardship and good use. He is the recipient of over two dozen awards. To mention only two: The National Humanities Medal in 2010 and the Richard C. Holbrooke Distinguished Achievement Award in 2013. He is also the author of over 50 books. His published works include Nathan Coulter (1960, his first novel); The Unsettling of America: Culture and Agriculture (1978); Standing By Words (1980); What Are People For? (a collection of essays written between 1975 and 1989); Collected Poems (1985); It All Turns on Affection (2012); Our Only World: Ten Essays (2016); The World-Ending Fire (2017). Wendell Berry received a B.A. from the University of Kentucky (1956) and an M.A. in English (1957). From 1962 to 1964 he taught English at New York University and from 1964 to 1977 creative writing at the University of Kentucky, returning to the English department from 1987 to 1993. In the 1970s and the early 1980s he edited and wrote for Rodale Press, specifically for its publications Organic Gardening and Farming and The New Farm. For further information about Wendell Berry’s books and legacy, contact The Berry Center in New Castle, Kentucky.